Ein Lernprogramm für Musiktheorie namens Maestoso für stiftbasierte Computer. Inspiring musicians and non-musician hobbyists alike can enjoy various benefits from learning music theory beyond its importance in performing music itself. Such reasons include developing their mathematical abilities, improving their reading comprehension, expanding their memory capabilities, better appreciating music that they listen to, and so on. However, current resources that are available for teaching music theory to students present their own inherent disadvantages. Specifically, traditional music theory classroom centers assume that students already have existing musical knowledge, existing self-study paper-based materials lack immediate feedback, while emerging educational apps either lack stylus-based interaction or intelligent feedback appropriate for novice students. 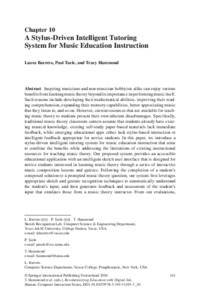 In this paper, we introduce a stylus-driven intelligent tutoring system for music education instruction that aims to combine the benefits while addressing the limitations of existing instructional resources for teaching music theory. Our proposed system provides an accessible educational application with an intelligent sketch user interface that is designed for novice students interested in learning music theory through a series of interactive music composition lessons and quizzes. Following the completion of a student´s composed solution to a prompted music theory question, our system first leverages appropriate sketch and gesture recognition techniques to automatically understand the student´s input, and then generates feedback and assessment of the student´s input that emulates those from a music theory instructor. From our evaluations, we demonstrate that not only did our system automatically understood students´ composed solutions with reasonable accuracy, but also that novice students were able to successfully grasp introductory music theory concepts from a single session using our system.